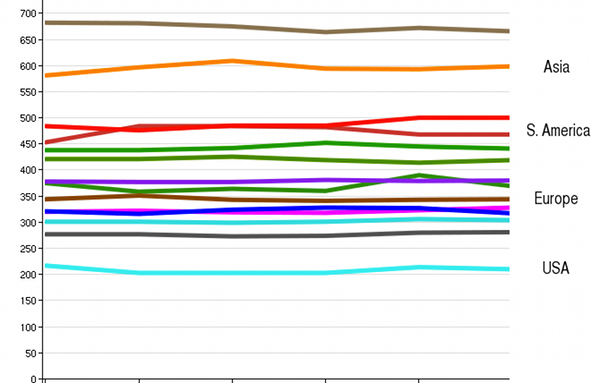 A cool thing is that you can measure these relative latencies yourself, using the present-day internet. If you run a website with a decent amount of worldwide traffic, you can use that traffic to map out how the internet responds with regards to you, and see how that matches with the gross structure of the 'net. I wrote about a cheap and cheerful way to generate this data last year, and the code has since been open-sourced as part of Yahoo's Boomerang measurement framework. The basic idea is to have your users perform two tiny network requests: one to a throwaway hostname generated in the moment, like 8j48sas.dns.example.net/A.gif, then another to a different single-pixel image on the same host, 8j48sas.dns.example.net/B.gif. The first request will require a DNS lookup, TCP handshake, and HTTP transaction. The second only needs to do the TCP and HTTP steps. Now you have fuzzy measurements of how long it took to do a full HTTP round-trip (B) and to do a full end-to-end DNS lookup (A - B). The median value only tells part of the story. 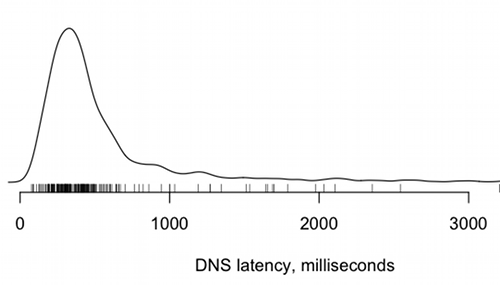 Here is the worldwide DNS latency data as a density plot, to show the distribution. Notice that a substantial number of users took more than 500 milliseconds just to look up a hostname. This is the uncached worst-case, of course, but it's something to keep in mind. Here is the chart for measurement B, the TCP + HTTP latency. This better reflects the real "geography" of the internet, because the HTTP requests travel all of the way back to our web tiers in the United States. There is much less volatility in these measurements day-to-day; it's controlled more by basic network conditions and speed-of-light and less by the health of various DNS recursors around the world. These low-multiple countries tend to have fortunate geography, or a strong history of economic relations with the United States, or both. 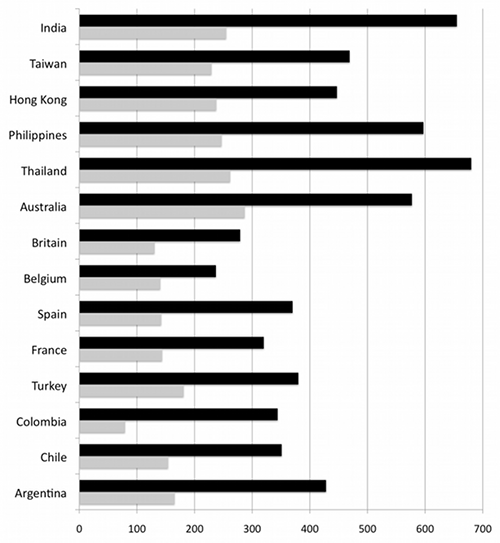 Other countries with less-strong trade ties, such as Spain, or lots of little islands like the Philippines, have multiples nearer to 2.5X and above. While Australia is a bit farther than Thailand it's 15% closer as far as the internet is concerned. More investment has been put in by the cable operators to make that route fast and wide. In fact, Australia (population 22M) a comparable amount of bandwidth to the US as all of South America (population 385M). The multiples of South American countries start at 3.5X and go up from there. North-South routes are hurt by an unlucky trifecta of mountains, long land crossings, and archipelagos. There is only one cable that serves the Pacific side from Los Angeles to Panama. It's hard to justify building lots of capacity on the Pacific side, because the Andes mountains cut off that part of the continent from the rest. Most traffic follows a long and painful path across the entire length of the US to the Atlantic, then takes a right turn and down another 800 miles of the Florida peninsula. It exits Miami and immediately hits a congested maze of cables, hopping in and out of the water as it navigates the islands of the Caribbean. Someday South America will get better connected, but natural barriers drive the costs way up. These measurements are very skewed towards the United States. It would be awesome to see measurements from other spots and different traffic patterns from around the world. The code to collect this data (and a lot more) is open-source and simple to implement. So try the experiment for yourself and let me know what you find. 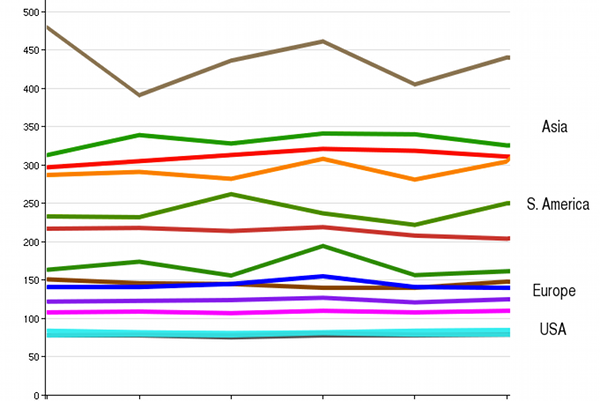 This chart generally agrees with data gathered by Yahoo and Microsoft. The data is very US-centric; the picture will be quite different if you were to run the experiment from a site based on another continent. Facebook's servers are largely in the US, so naturally we care most about how to get bits from here to there and less about, say, between India and Saudi Arabia.